In 2007 under supervision of VBN and LNV, a study on the population dynamics of Northern wheatears was started in the dune area van Northern Holland. This work consisted of searching and finding nests, colour ringing and gathering biometrical data and reading colour ringed birds. These data are the basis for quantifying variables in population dynamics, such as breeding success, survival, dispersal and the proportion of second broods. This information is necessary in order to understand why the population decline occurs. Young Northern wheatear. Botgat 2008. © Bram Ubels. The research is carried out by SOVON and Radboud University Nijmegen / Stichting Bargerveen. The study areas were the Noordhollands Duinreservaat and the entire dune area between Callantsoog and Den Helder. Thus, we have obtained approximately more than 90% of the population in mainland Northern Holland. Finally, at a number of nests in the Noordhollands Duinreservaat research is done on the food ecology of Northern wheatears. During 3-6 days during the nestling period at these nests the diet was filmed and samples of insects have been gathered in order to see what food is available. 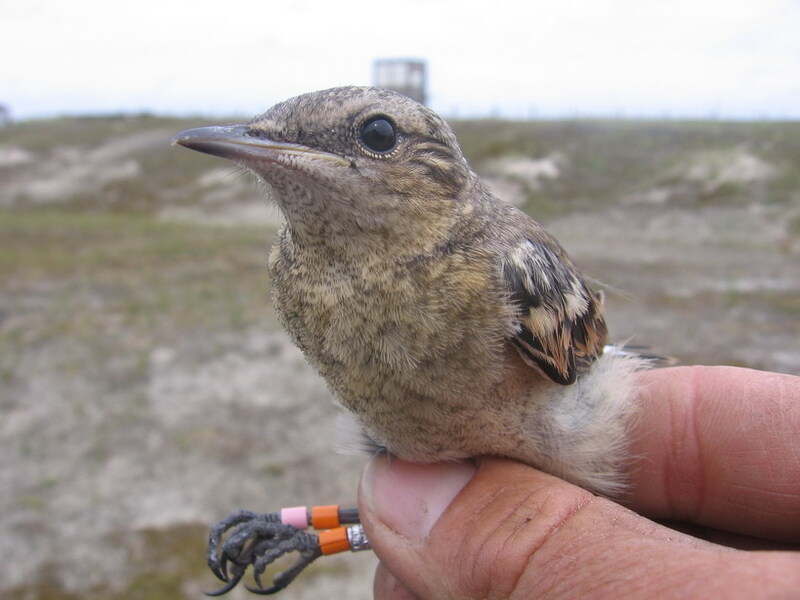 In the Aeckingerzand (Southeast Friesland), a large number of Northern wheatears was ringed. A combination of three colour rings and a metal ring. On each leg, two rings are present, where the metal ring is part of the code. Observations on colour coded Northern wheatears can be reported to me. See here a concise summary of obtained population data of Northern wheatears, years 2007-2009, written by Chris van Turnhout & Frank Majoor (november 2009).